How about a flying wedgie? Hey! I used to do that with my MGB on the MRRRC! That's Mud River Road Race Course to the uninformed. Totally unsanctioned by any racing organization. YeeHaaaa! The Cheltenham Motor Club is still going strong. 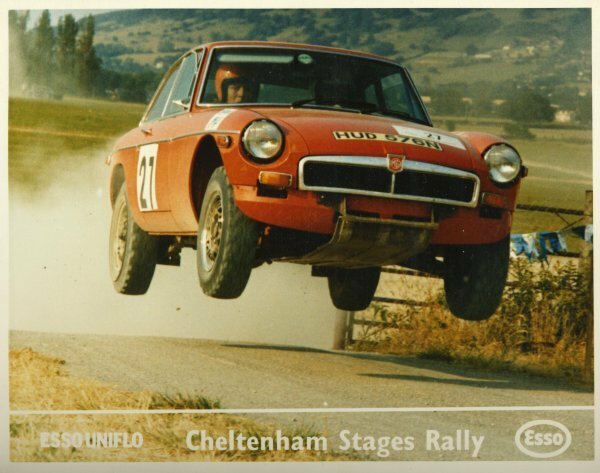 I've been in touch with these exceptionally helpful car nuts, and they were able to confirm that the photo above shows Ian McKean (and his navigator J. Kerswell in the orange helmet) competing in the Cheltenham Stages Rally of July 1975 - the jump is on the Cheltenham Racecourse stage. Ian McKean finished 5th overall in his factory-prototype left-hand-drive MGB GT V8! Incidentally, Cheltenham Motor Club was founded in 1906. As their website says, they're "one of the oldest active Motor Clubs in the United Kingdom and is one of only a handful to own its own Clubhouse." They're in the Southwest of England and they host all sorts of motoring activities throughout the year - they're especially keen on getting new people engaged in all forms of amateur motorsports. In their clubhouse, which used to be The Crown Inn, they have their own licensed bar / pub and it's even listed in the "Good Beer Guide". Their race archives go back to 1920. Very cool, eh? Mr. Kerswell, as an experienced and professional navigator would be saying something like "300 yards then hard right" but I'd be screaming for my dear life! Similar to the ride Curtis gave me in his BGT V8 last summer, but I'm not sure we got completely airborne at any time. Edited 1 time(s). Last edit at 01/06/2009 06:08PM by Bill Young. The MRRRC was indeed sanctioned by the Mud River Road Racing Club, longtime predecessor to the British American Deviant ...whatever. Another famous course run by the club included the infamous Chicken Farm Road, where pictures like the above could be snapped nightly. Yeah, but you'd best watch out for the stump! There was also a certain stretch of US Rt. 60 over Sewell Mtn. between Sam Black Church and Lewisburg. 2/3 lanes of the finest quality blacktop that was so deserted the grass grew up in the cracks. You good ole mountain boys didn't have all the good roads, there were a few where I grew up as well. The railroad crossing on the "Brick Plant Road" would launch you like an ICBM with a little speed. Have you ever seen a '58 Chevy Impala fly? For the twisties it was the access road to the Kerr Water Research Lab, 2.5 miles of nothing but curves up and down hill and all brand new concrete built by Uncle Sam. I was in Cheltenham last April, had the opportunity to drive a friends car in the local MotorGrass race, a dirt track race, and attended a "boot sale", a swap meet wherein you load what you can in the boot of your car and sell from there. Fauxall engines, inline4 front wheel type was typical. mini coopers with the fauxall mounted in the rear was the car of choice, with modified street tyres these cars would dance around the track, opposite lock steering 90% of the time, great fun. look up MotorGrass racing on the internet. My son sent me the link to this web forum. Great to see the old yumping "B" on the web. I have a copy of that picture and think it was once on the wall at the Cheltenham Motor Club bar in huge scale. I had two bodyshells after hitting a tree head-on with the first. I guess the picture here was my second bodyshell. It went slightly banana-shaped about a second after the photo was taken! Gotta go now, but shall look back in soon. PS Curtis, where did you find the photo and learn I had come 5th on the Cheltenham Stages in 1975? Wow! That's very cool. Thanks for posting that snapshot!! !